I am coming back to Java after 6 years. I am a software professional working on Mainframe 3270 screen coding CICS/Cobol program. I studied java, c, c++ and .net languages at college. In college, my nick name is Dennis Ritchie.. I am very much interested in object oriented languages, but I got job to work on mainframe environment. Thanks to IBM who brings Java on mainframe - System z Application Assist Processor (zAAP) and Pershing who gives me an opportunity to work on this ..
zAAP, which runs asynchronously alongside general-purpose processors, is designed specifically to execute Java programming under the control of the IBM JVM and assist the general-purpose processors by executing the Java cycles. 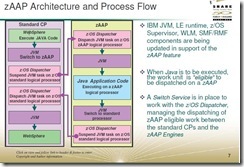 Utilizing zAAP, therefore, customers can expect to realize reduced demands and capacity requirements on their general-purpose processors, which can be better utilized by other, non-Java workloads.